Based on his research, the author developed two glucose prediction tools, and he was able to reduce his fasting plasma glucose (FPG) from 185 mg/dL to 119.6 mg/dL (28 lbs. weight reduction), daily glucose from 279 mg/dL to 117 mg/dL, and hemoglobin A1C from 10% to 6.1%. He examined correlations between FPG and postprandial glucose (PPG), carbs and sugar intake, and exercise amount but found all were below 7% (very low) and finally discovered the major cause – Weight. 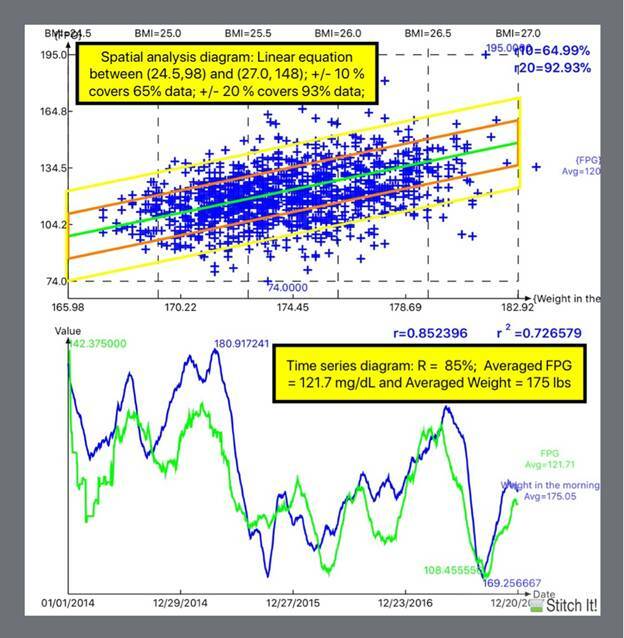 Based on 25,000 data of 1,449 days, (1/1/2014 – 12/20/2017), he found 85% correlation between FPG and Weight. In time series diagram, there are two high peak periods and two low valley periods of Weight, and the FPG curve followed the Weight curve like its “twin”. In spatial analysis diagram of BMI vs. FPG (without time factor), there is a “quasi-linear” equation existing between two coordinates of BMI and FPG: from point A (24.5, 98.0) to point B (27.0,148.0). The stochastic (random) distribution of data has 2 clear “concentration bands” stretched from lower left corner toward upper right corner. The +/- 10% band covers 65% of total data and the +/- 20% band covers 93% of total data. Only the remaining 7% of total data are influenced by other 5 secondary factors. After capturing basic characteristics, he then developed a practical tool to predict each day’s FPG value. The final prediction accuracy is 98.3% with 85% correlation between predicted and actual FPG values.